The Book of the Dead is a collection of spells which accompanied the deceased in the realm of the dead. The spells supplied information about the residents, places and incidents in the afterlife which helped the dead person to avert danger and to be accepted among the gods. 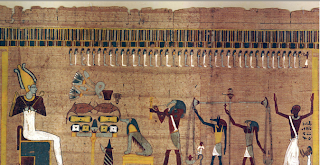 Altogether, the Book of the Dead – as a text corpus – comprises c. 200 spells. The actual composition of a single book, in contrast, varies, so that each source is unique. 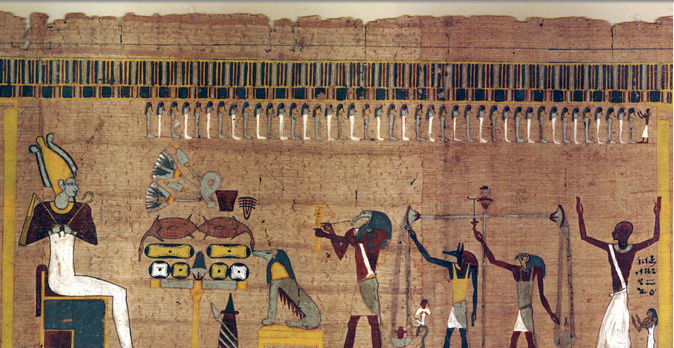 The instances of the Book of the Dead are transmitted on papyri, mummy wrappings, shrouds, coffins etc. In total, there are nearly 3000 objects. Their records and photographs (~ 20.000) have been gathered and worked on within the Book of the Dead Project which started at the University of Bonn in the 1990s. Recently, they have been integrated into a digital archive, in cooperation with the Cologne Center for eHumanities (CCeH). There are two kinds of place references included in the data records: references to the object’s current location (country, place and institution) and to their provenance (place of origin and specific locality). The latter are being integrated into the Pelagios network. In terms of granularity, the places of origin have been chosen for the mapping as their level of granularity corresponds roughly to the level of the precisely located places identified in Pleiades (e.g. Athribis or El Kurru). The first step in the alignment process was to import the Pleiades+ dataset via Oxygen and convert it to XML. This was done because the digital archive is based upon an eXist database and the data thus reside entirely in the XML cosmos. An XSLT script was written to map the Book of the Dead place occurrences to the places in the Pleiades+ dataset. That way, about half of the places could be mapped automatically. The results were checked in consideration of the geographic coordinates given in the archive. There was only one mismap: “Theben” was mapped to the Greek Thebes instead of the Egyptian Thebai. Most of the remaining places were identified manually by means of their corresponding Greek place names. In the archive, a great deal of the place names are German transliterations of Arabic names. Up to now about 90% of the place names have been identified. A main component of the digital archive’s data model is an external knowledge base simply called “Wissen” (knowledge) bringing together additional information such as geographic coordinates, year dates for periodization, canonical and selective lists for spells, degrees of kinship. Part of this and relevant to the Pelagios alignment is a distinctive list of places of origin, to which the Pleiades IDs have been assigned. An XQuery module was created to provide single annotations, a dataset dump and a dataset metadata description in RDF/XML. Single annotations and the dataset dump are created on the fly by joining the data record’s place occurrences to the Pleiades IDs in the knowlegde base. So far, the annotations are organized as one single dataset as their number is relatively small (currently, there are 1346 annotations). As a next step the Pelagios tools and widgets will be explored in order to deploy them on the Book of the Dead project website.